Providing education is a central part of the Quicken Trust’s strategy to transform the needy village of Kabubbu in Uganda. And the children are rising to the challenge. Dozens of UK schools have forged links with Kabubbu through Quicken. 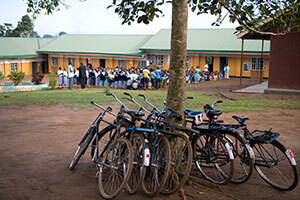 Many have taken students to Uganda to support projects. It’s a partnership which benefits everyone. These schools include: Bede’s; Burgess Hill School for Girls; Heathfield Community College; Hillview School for Girls; Mayfield C of E Primary; Ratton; St Catherine’s College, Eastbourne; Ark William Parker Academy, Hastings; and Willingdon Community School. Repton College in Dubai is another partner. Completing primary education is no small achievement in Kabubbu because children face challenges unknown to UK youngsters. It is not uncommon for children to lose family members to illness. Many walk five miles to school, starting out in the dark. Crop failure at home means a poor diet; torrential rain on a house that leaks can mean a sleepless night or waking to find school clothes soaked. The opening of the primary school in February 2002 – and the addition of nursery classrooms six years later – has had a dramatic impact on the life chances for the children of Kabubbu. At present over 500 children attend the school – 250 of them funded by sponsors in the UK, the rest having their fees paid by their families. The school has 16 teachers and 8 support staff. Jackeline’s story shows how precious education is to the children of Kabubbu. Her parents died in a fire at their house. Jackeline was left with terrible facial scars. In 2010, aged 12, she was determined to speak at a thanksgiving service to mark the 10th anniversary of Quicken’s involvement in Kabubbu. She made sure she was at the front of the queue and told the crowd: “I now have life because I am able to go to school”. 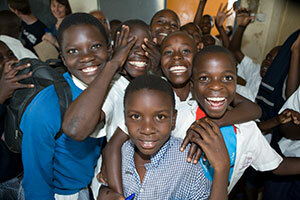 A sponsored child will receive a full education, a uniform every year and free healthcare. Primary school pupils also get two meals a day – nursery children go home at lunchtime. Every sponsor is asked to commit to supporting their child through all the years of primary school. (Sponsor a Child). Every school day starts with cleaning duties. Next it’s Assembly – a joyous, musical event in which visitors often participate as speakers. (Video) For some, it’s a highlight of a trip. (Visit us as a volunteer). School gets off to an innovative start for youngsters in the nursery class. Not only do they learn very basic literacy and numeracy skills – they are also encouraged to play. It’s a rare concept in rural Africa where the focus is usually on retaining knowledge to reproduce in exams. The Quicken Trust is already finding that children who start in nursery progress further later because they have stronger foundations. The curriculum develops as the pupil progresses through primary level – with maths, English, sciences, social studies, art & crafts and RE among the subjects taught. From the fourth year of primary, all lessons are taught in English. Two Sussex schools linked to Kabubbu through Quicken – Mayfield C of E Primary and Heathfield Community College – have exchanged staff through a scheme run by the British Council. Education is about more than lessons. There is a range of sport and other activities on offer at the primary school. Among them is the Kabubbu Children’s Choir which has visited the UK twice. 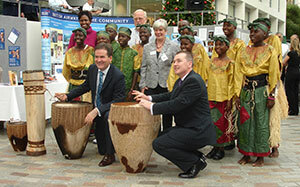 On its first trip, in December 2005, the children even performed for senior BA staff at Heathrow Airport. On the second visit the choir performed at the 1,700 seat Congress Theatre in Eastbourne to a packed audience.